If you find you are rocking and rolling with your legs open well then challenge what you know close those legs and grab those toes! I used to think I could never do this version of the Open Leg Rocker! I could rock and roll no problem. But as soon as I would grab my toes I would fall back and I couldn't get back up. I felt like those old infomercials "I've fallen and I can't get up!" But, once I realized that this version of the Open Leg Rocker was calling on the strength of my Double Straight Leg Stretch and Teaser 2 I not only rocked back up but I was able to do it again and again. Reach for your toes from your back and press your feet into you hands. Usually done after you do your Open Leg Rocker you don't need to do much set up. Finish your third or fourth regular rocker and then HOLD! Open and close your legs a few times preparing the body to really turn the inner thighs on and connect your shoulders to your back. Then keep the legs together and grab your toes. Once you have your toes and you press your feet into your hands and your hands into your feet feel your shoulders reaching from your back. Then continue to rock and roll back and up three times. Once you finish traditionally you walk your hands down your legs and lie on your back with your legs in the air for Corkscrew! Just remember you do not need to do this variation. 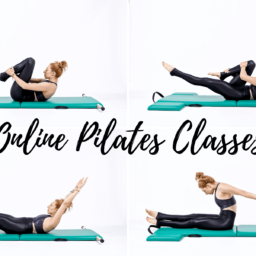 It's another level meant to challenge what you already know and deepen your Pilates practice. If you find you can rock back but you cannot get back up do a check-in. You are most likely letting go of your center and falling back and then, of course, you can't get back up. I mean, you cannot drive on a flat tire. Maintain the connection to your back and center as you go back and you will find your way back up!